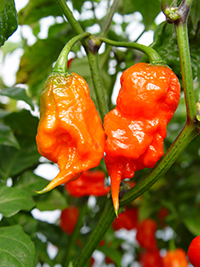 We offer Carolina Reaper for sale as Pepper Plants, Pepper Seeds and Fresh Peppers! Carolina Reaper is currently the Guiness Book Record Holder for the World's Hottest Pepper averaging 1.569 Million Scoville Units, and peaking at an incredible 2.58 Million Scovilles. This is a variety developed by selective breeding, between a red Habanero and a Naga from Pakistan. Congrats to Ed Currie and PuckerButt Pepper Company of Rock Hill, SC. Carolina Reaper Pepper Plants - Plants available in spring, shipping late March to early June. Carolina Reaper Pepper Seeds - Seeds shipping January through March. Carolina Reaper Fresh Peppers - Fresh shipping late August to early October. We offer two strains of Carolina Reaper. The true strain direct from the breeder, Smokin' Ed Currie; as well as another strain, Carolina Reaper. Cross Country Nurseries is a licensed grower of Smokin' Ed's Carolina Reaper®. Smokin' Ed's Carolina Reaper® is trademark-protected. Pepper pods and/or seeds from Smokin' Ed's Carolina Reaper peppers cannot be legally sold to others. You must plan to use these peppers for your own use.